Castelfiorentino lies 42 km. South-west of Florence. 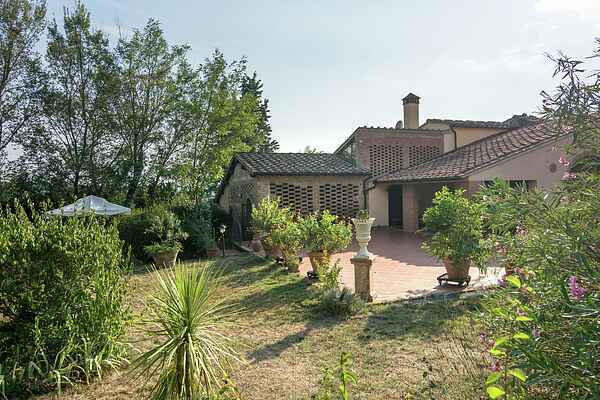 The agriturismo is situated on top of a marvellous hill, in the middle of the triangle of the most beautiful Tuscan art cities Florence, Siena and Pisa. Sorbigliana is qualified spot in the middle of the nature in where you can really come to rest. The environment has long walking courses through the nature. The agriturismo provides with all comfort and has remained the typical characteristics of the medieval time. At the spot you can taste different products which are cultivated here, among which wine, olive oil, tartufo and honey. In the agriturismo there is also a restaurant where you can enjoy the traditional meals from the area. Your holiday house is decorated with a lot of care, and therefore radiates a warm and a luxurious atmosphere. You have a communal outdoor swimming pool at your disposal. In our farm there is also a little restaurant for the guests in which is possible on request to enjoy tuscan typical foods, all done withour organic meet, vegetables , oil and our chianti wine.Our production are also honey and truffle. We suggest also to taste our beauty soap and moisturizing fluid , done with our organic oliv oil.